Yesterday was International Talk Like A Pirate Day. When you have small children and a bike with the turning circle of a barge, this is a recipe for fun. 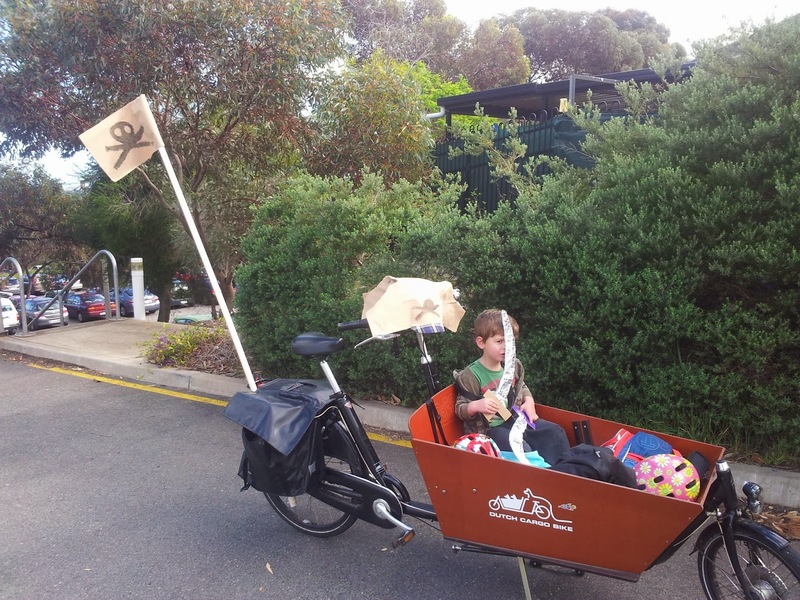 So 45 minutes with some old canvas, some spare water pipe, tin foil and cardboard, and the HMS Bakfiets was hijacked by a scurvy crew of pirates. We were fairly well received at Isabel's school, mostly by the young lads. But the best reception was at lunch time when I rode a colleague down to the University plaza in the box, brandishing our cutlasses and yelling Avast! at anyone in our path. We even had some piratical conversations with others on the plaza who were aware of the day. Someone did take a picture of us, but I don't know where it has got to.